Have you ever wondered about the safety of the cleaning products you use in your home? How about tackling spring cleaning this year with some home-made products that are easy and fun to prepare while at the same time getting the job done? Nature offers many alternatives to chemicals; alternatives that are powerful anti-microbial. For example, essential oil of Oregano kills a broad spectrum of bacteria including E.coli and spores from anthrax. It can therefore be substituted for bleach products such as Clorox. 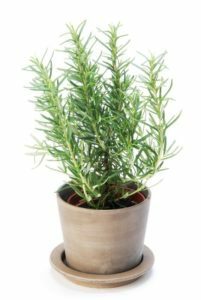 Rosemary is another great option because of its natural antibacterial and antiseptic properties. In times of the plague, Rosemary was worn around the neck for its antiseptic qualities. Below find two simple recipes – shared with permission from Theresa Mieseler, author of Beyond Rosemary, Basil, and Thyme, available from www.shadyacres.com and Amazon. The book includes 25 recipes. Combine all ingredients and pour into a spray bottle. It will fizz initially and then settle down. Shake before spraying on the surface—wipe off with a soft cloth. Combine all ingredients and pour into a spray bottle. Before use — shake well.